This is an exhilarating and affecting show, simply told with great humour, a splendid sense of mischief and a brilliant feeling for story and theatre. 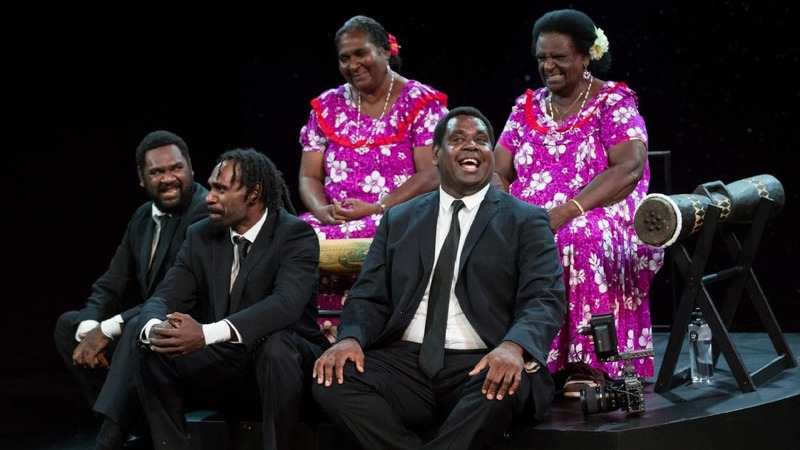 It is co-created by actor Jimi Bani with director Jason Klarwein, based on a story by Jimi and his father, Dimple Bani, from the island of Mabuiag in the Torres Strait. It is about the importance of passing on culture in the age of technology. Jimi performs it with several members of his family: his mother and grandmother, two of his brothers and his son, Dmitri ­Ahwang-Bani, a teenager whose obsession with his smartphone prompts a lot of the comedy but is also part of the point of the story. Jimi is about to become the ninth chief of Wagadagam, on Mabuiag, and Dmitri, after he puts down his phone and learns to dance and sing the traditional stories, will one day be the 10th. There are four generations on stage, speaking three languages. It is wonderfully performed. The Banis, with many more generations behind them, are the main part of this. The women, Agnes and Petharie, the brothers, Conwell and Richard, and the boy Dmitri create a stirring celebration of family around Jimi. Jimi is supposedly leading the storytelling but they all have things to say. The appropriation of contemporary culture is evident in their dress, with Dmitri discarding his stylised traditional costume to put on boardshorts, an emblazoned T-shirt and peaked cap. But it continues, and reaches back into the colonising era, in ­Simona Cosentini and Simone Tesorieri’s clever design. This includes two beautifully made dioramas straight out of an imperial anthropological museum, which are brought to life in Jimi’s narration of the old stories. They are peopled by small puppets, filmed in close-up and projected live on to a huge screen at the back. There is also a delightful, old-fashioned pop-up book of scenes of Mabuiag, with little animations of another story, also projected. The sound and projection design by Justin Harrison and the lighting design by Daniel Anderson contribute to this. This is all theatrical wizardry, to complement the performers’ warmth. Jimi also plays, with a wickedness that is great fun, the anthropologist who first went to the Torres Strait to document the people, steal their artefacts and send them back to England. It is revealed that none of the objects has ever been returned. 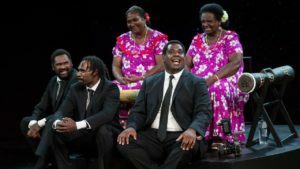 There is a family grieving at the end of the show that is very moving but the need to keep the fire burning, the fire of culture, is gloriously alive.